Recently I posted video footage ofMuslims praying in the street at NYC’s 26Th Annual Muslim Day Parade. Of course that was not enough for NY’s Islamic community. They see America is in a state of weakness because of the politically correct disease, and will continue to push their religion in our faces. This upcoming event is another Islamic display of power, and let me make this clear. Muslims do not care what infidels want, they stand with Islam above all! It is time the rest of the country comes to terms with this, and demands an end to all Muslim immigration. From the FRIDAY PRAYER AT WALL STREET Facebook page. FOR THE SAKE OF HUMANITY-PLEASE READ! THIS EVENT IS OPEN TO LITERALLY EVERYONE. MUSLIMS AND NON-MUSLIMS. THOSE WHO PRAY AND THOSE WHO DO NOT. Join the peaceful protest! Spread the word to everyone you know! BE PART OF THE SOLUTION! NOT PART OF THE PROBLEM! *Insha’Allah (God willing) the Imam is Talib Abdurashid from Majlis Shurra *Location: Meeting at the park next to the stock exchange! Right where the Statue is! Our Forefathers would be very disappointed. Don’t you think? They spent COUNTLESS hours building America up and with a snap of your fingers is all fall apart. What a shame. Wake up America! 700+ peaceful protesters have been brutally arrested! They are NOT criminals. *NOTE: The photo used is actually getting pulled off Facebook…so, the photographer added a lil text and renamed the file. Pass it on. I’m SURE the media doesn’t want this one out there. Share it as much as you can. Once again we see Muslims using non-Muslims to help the cause of Islam. A cause they believe God has told them to live and die for.Unfortunately many non-Muslims blindly believe what Muslims tell them, but there are many crucial verses in the Koran that the Muslim puppet-masters do not tell their non-Muslim puppets. Here are two of them. As I stated, Muslims are using non-Muslims and in the end will side with Islam over them. This second verse states the ultimateintolerant goal of Islam. Graphic Designer, Tea Partier, Blogger from Colorado. This entry was posted in Islam, Islamo-Fascism, Media Bias, Multi Culturalism, Occupy Wall Street, Sharia Law. Bookmark the permalink. 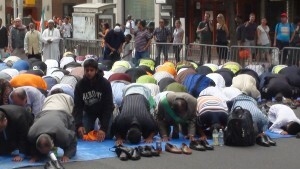 5 Responses to NYC: ISLAMIC FRIDAY PRAYER AT WALL STREET! Thank you very much sir. Keep up the great work! Thank you Tom for posting this article from Logan’s Warning! Thank you for all you do!! Thank you for endorsing Chris Logan’s (Logan’s Warning!) article Tom! Best wishes to you and your family! Your children and grandchildren are going to inherit a very different America than the one you live in today. Their America will have no middle class. Education will only come with crushing debt. The sole purpose of work will be to pay the taxes demanded by a government they are powerless to resist. English will give way to the hodgepodge of languages spoken by those that chose to ignore what few immigration laws remain. The rule of law will only exist to protect the rights of those that break the law and exploit the system. Western civilization will only really exist in the history books, if they are allowed to learn about it. Wait, How Did Pelosi Get in on the Visa IPO? Mexician Trucks in the U.S.